Swing-Speed.com - Baseball team coach buys 7 somax power hip trainers, batting average jumps 61 points. Baseball team coach describes many benefits of Somax Power Hip Trainer workouts. Baseball players 17 and older on the Warriors high school team worked out on 7 Somax Power Hip Trainers during the season, pumped up their batting average from .321 to .382, bumped up their swing speed as much as 15 mph, and won the state championship with a 35-3 record. * Their prior year record was 25-6. One of the players improved so much that he is now on track for a baseball scholarship--whereas before no school was interested in him. Faster bat speed means you can wait longer and get a better eye on the pitch--which is why the team average jumped 61 points. Watch the entire beginning workout (2 minute drills) as the players increase the strength and speed of their hips and improve the separation between their shoulders and hips. 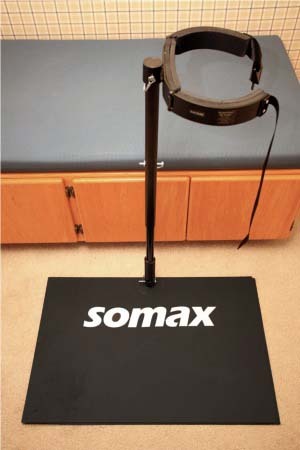 The Somax Power Hip Trainer is the only baseball training aid that increases the strength and speed of hip rotation for batting. Every increase in hip speed is multiplied 18X at the bat because of the 18:1 ratio of the 54" distance of the sweet spot on the bat to the center of rotation and the 3" distance of the hip joints to the center of rotation. Here is a short video that shows how to assemble and use your Power Hip Trainer--the world's most effective baseball batting speed and pitching speed trainer. Somax Power Hip Trainer Easy Assembly. The special heavy-duty steel spring at the base of the Power Hip Trainer adapts to each individual players stance while providing the resistance you need to build strong fast hips--and effortless bat speed. Are Your Hips Strong Enough for baseball? Before going any further, have someone test your hip strength for baseball. You may be surprised how weak these muscles are, even if you follow a good conditioning program. 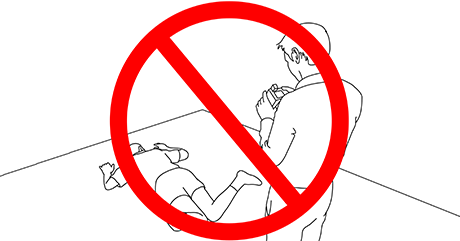 Lie on your stomach, bend both knees 90º, and keeping your knees together, move your feet away from each other as you see in the illustration above. Now have someone hold your feet apart as you try to bring them together. Be sure not to do this test if you have any problems with your knees. If your hips are strong enough for baseball, you will be able to snap your feet together so fast you can throw them back across the room. After all, your hip muscles are much bigger than their arm muscles. But if you are like most baseball players, you will have to struggle to bring your feet together. This means your hips are not strong enough for baseball. The reason is simple—there is no resistance to hip rotation during the baseball swing, so no amount of practice on the field or time in the batting cage will increase your hip strength. You need resistance to build up strength. To build up hip strength, you need the Power Hip Trainer. Are your hips flexible enough for baseball? Keeping your knees together, move your feet away from each other. If you have enough flexibility in your hips for baseball, you should be able to move your feet apart a total of 120°. That is 60° on each side. 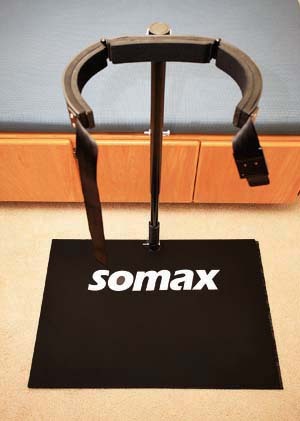 You need a minimum of 45° on each side to benefit from using the Somax Power Hip Trainer. If you don't have 45 degrees, your hips are too stiff to turn fast no matter how much you increase your hip strength. If you have less than 45 degrees on each hip, take a look at our Microfiber Reduction program, which can increase flexibility 100% beyond stretching. A simple and accurate way to measure is to have someone get down on the floor and take a photo of your legs in this position. Then get a print of the photo. As shown above, draw vertical lines through your knees, a line through the center of each lower leg, and measure the angle between the two lines with a protractor (available in any office supply store). 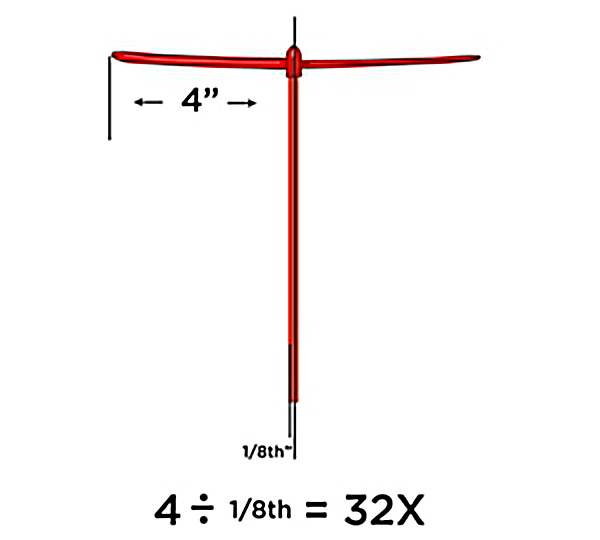 Be sure to take the time to measure. Don't try to guess! 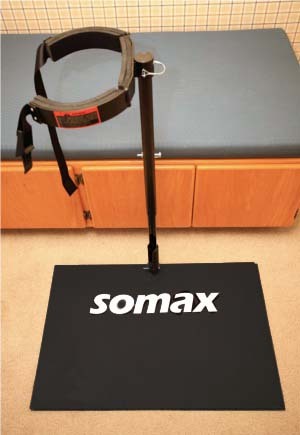 The Somax Power Hip Trainer is the only exercise machine that increases the strength and speed of your hips so that you can easily add up to 18 miles an hour to your bat speed. First, you warm up with the padded steel hip cinch in the neutral position. This also stretches your hips to increase flexibility. Tight hips are the major cause of back problems and slow bat speed in baseball players. Bat speed trainer - nuetral position. Next, you turn the padded hip cinch to the closed position to increase the resistance. Here you work on your hip strength and bat speed. Bat speed trainer - closed position. Finally, you turn the padded hip cinch to the open position. 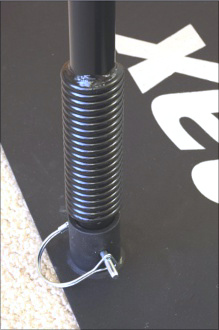 The heavy duty steel spring at the base will turn your hips faster than you can turn them yourself--helping you break through your mental hip speed and bat speed limits. Bat speed trainer - open position. The distance of the hip joint to the center of rotation is 3 inches. The distance from the sweet spot on the bat to the center of rotation is 54 inches. 54 / 3 = 18. Any increase in hip speed will be multiplied 18 times at the sweet spot on the bat. 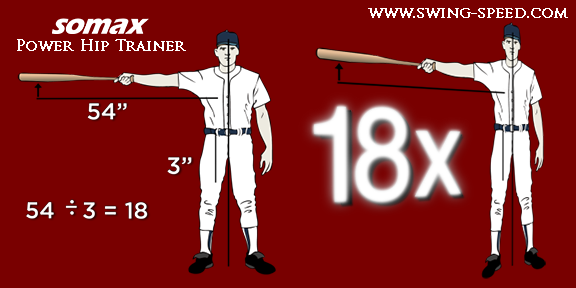 It is the easy, effortless way to add 18 mph to your bat speed. It's the same in baseball. There is no leverage in your arms. The leverage is all in your hips. That's why, if you want to increase your bat speed, it makes more sense to increase the strength and speed of your hips than to increase the strength of your arms.